This plugin acknowleges authors for their post by displaying a brief biography about them at the end of their post. Giving authors the credit they deserve! 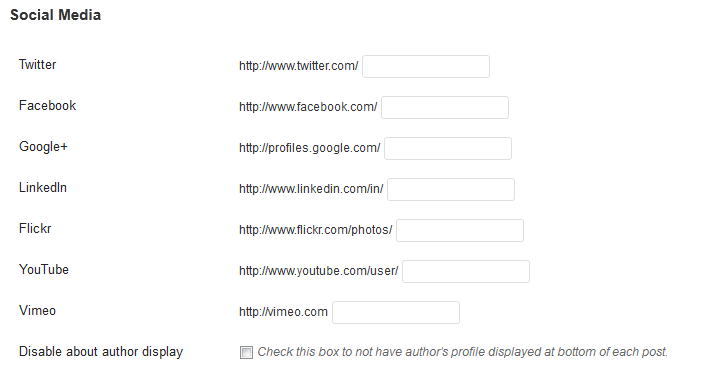 The plugin also has the option to display the author’s website user profile or a custom profile. This plugin is perfect if you have multiple guest bloggers on your website and they do not each have a user account. It also gives an added incentive for bloggers to write guest posts on your site. Multiple custom profiles can be created and they take preference over website user profiles. 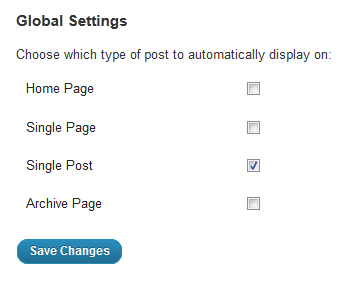 You also have the option to specify a specific profile to display for each post. Custom profiles are completely configurable, it can include links to social media (such as Twitter, Facebook, LinkedIn & Google+) or you can specify any HTML/text you want to display. To specify a custom profile on a post, you just need to create a custom field called “post-author” with the value of the custom profile username. Display website user profile or a custom profile. Custom profile displayed take precedence over website profile. Ability to display profile display on a per post author basis or on a post basis. Option to include social media buttons on both website profile or custom profile. Custom Profile is fully configurable. You can choose to display anything you like in there. Why should my post have an author profile? Author profiles at the end of every posts are important as they allow readers to learn more about the post authors. Search engines also uses author profiles to identify users and when done properly, are able to link users to post articles. Have you done a Google search and notice that some of the result entries have a picture of the author next to them? That’s because those posts have an author profile. Below is an example of a search result in google which displays an Author profile picture. If you find the Custom About Author WordPress Plugin useful, show your support and make a donation. This section describes how to install the custom about author wordpress plugin and get it working. Upload the folder `custom-about-author` to the `/wp-content/plugins/` directory. By default, the plugin will start showing about author displays for all posts. The information will be taken from the user’s profile. In additional, there will now be new fields for social media. (See image below). The social media icons will only be displayed for those which you have filled in. Lastly there is an option “Disable about author display”. Checking this will disable the automatic displaying of the about author for all posts written by that author. Create a custom profile to display. Specify a custom profile to display which has a different username from the post’s author. Have complete control over the HTML being displayed. In the Custom Authors setting, you can change the global settings on which the custom about author is displayed. By default, it will only display on single post. Note: shortcodes are not affected by the global settings. If you do not want to use your user profile information in the about author display, you can create a custom profile instead. This is especially useful if you use a different address for your user and your gravatar image. To create a custom profile, just go to Custom Authors in the Users menu. There you can create a custom author profile. For custom profiles to replace user profiles, you will need to create the custom profile with the same username as that of the user. Add a custom field with the name post-author and the value would be the username for the custom profile you like to display for that post. In the screenshot below, the username being used is some-username. Note: Custom fields will display a custom profile even if the post author has chosen to disable the “about author display”. There had been many request for PHP code by developers wanting to integrate their wordpress theme with the custom about author plugin. The first method will display the custom about author information for the author of the post or page, while the second method, the username to display is passed into the method as an argument. The methods do not print the custom about author box to screen, but instead returns it. which will use the page or post author as the author to display. Customize the HTML code being displayed in the about author. There is the option in the custom author profile to display a custom HTML code in the about author display. 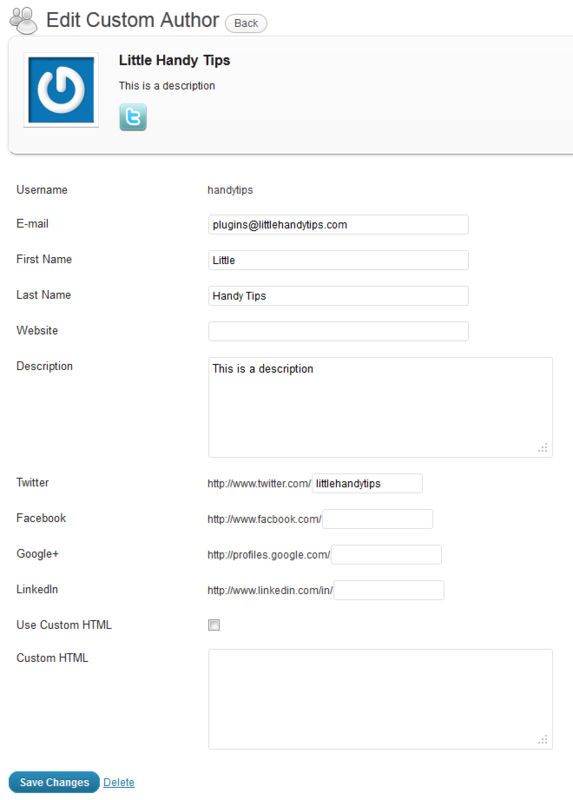 To do that, just check the box “Use Custom HTML” and enter the Custom HTML. Fix to facebook social media link. Q. If I have both a custom author and a website user with the same username, which will be displayed? Any custom author will take precendence over website users. So the custom author will be displayed. Q. If I have chosen to disable display for a profile user, would a custom author with the same username be displayed? No, if a profile user is disabled in the user settings, then no custom author will be displayed. The only exception to this is if you have a custom field in the post for “post-author”. In that situation, the custom author specified in that field will be displayed. Q. How do I disable the display for just a single post? Create a custom field in the post for “post-author” and put a non-existent username in there (e.g: nobody). Q. How does the plugin work to determine whether and which profile to display? 3. If author has disabled display and there is no valid author specified in (2). then nothing will be displayed. Visit the Forum to post your questions. Sorry I had to take the forum down as it had been getting too many spam post on there. Literally thousands a day.